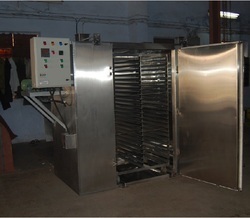 Pioneers in the industry, we offer gmp tray dryer, tray dryers, kilo lab tray dryer and standard tray dryer from India. Tray drier are extensively used in chemical, pharmaceutical , food , dyestuff and many other industries For Static Drying. Heating system is electrical with optionally steam heating attachment. A heater circuit interlocked with motor of the d\fan is provided so that the heaters are switched on only when fan motor is operating. Temperature is indicated by dial thermometer. Designed to comply with stringent GMP Norms. As an eminent enterprise, we are manufacturing, and supplying highly efficient GMP Tray Dryer. 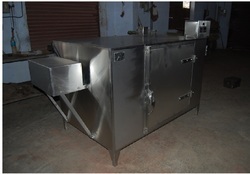 Our offered tray dryer is provided with control panel for monitoring temperature. This tray dryer is designed using the best quality material & cutting-edge technology in accordance with the set international quality norms. The tray dryer offered by us is checked by our quality checker for ensuring its flawlessness. As an eminent enterprise, we are manufacturing, exporting and supplying highly efficient GMP Tray Dryer. 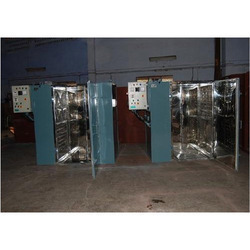 Our offered tray dryer is provided with control panel for monitoring temperature. This tray dryer is designed using the best quality material & cutting-edge technology in accordance with the set international quality norms. The tray dryer offered by us is checked by our quality checker for ensuring its flawlessness. 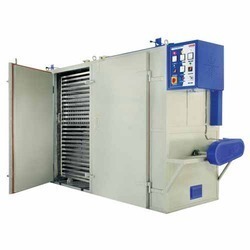 The driers are designed for uniform circulation of hot air to maintain same temperature in the drying cabinet. Constructed with rigid framework, double walled, heavily insulated with glass wool. Fresh air inlet with filter and moist/hot air outlet provided at suitable position. 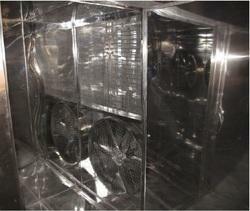 Designed for uniform circulation of hot air in the drying chamber. Electrical heating system Optionally Steam Heating. Thermostat is provided with the unit to control the temperature. Fresh air inlet with filter and outlet also with damper control valve. Owing of our extremely talented team of professionals, we are engaged in offering excellent quality Tray Dryers. Suitable for heat treatment, backing and drying applications, offered dryers are manufactured using high grade components and advanced technology in adherence with industry norms. Our quality experts test these dryers on different parameters in order to ensure their quality. In addition to this, provided dryers are available in variegated sizes and designs. Basically we want corporate inquiries. We are passionately engaged in providing an exclusive array of Standard Tray Dryer. chemicals, electronic components and baked food products, offered tray dryer is designed by our highly experienced designers from the finest grade components, at par with the market prevalent norms. In line with industry set standard, we provide this tray dryer in various sizes and shapes as per the requirement of our clients. Apart from this, clients can avail this tray dryer from us at affordable prices.